The head is proudly carried. Eyes-Dark hazel to dark brown, almond shaped, obliquely set and farseeing. Rims dark. Ears-Small, erect and slightly hooded, of fine texture and set well forward on top of head. The skull is flat, well chiseled and of medium width, tapering toward the eyes. The foreface tapers from eye to muzzle with a perceptible stop. Muzzle shorter than skull, neither coarse nor snipy, but with rounded cushions. Wrinkles appear upon the forehead when ears are erect, and are fine and profuse. Side wrinkles are desirable, but should never be exaggerated into dewlap. Wrinkles are most noticeable in puppies, and because of lack of shadowing, less noticeable in blacks, tricolors and brindles. Nose-Black greatly desired. TeethEvenly aligned with a scissors bite. Neck of good length, well crested and slightly full at base of throat. Well set into shoulders. Topline-Back level. Body-Balanced with a short back, short coupled and ending in a definite waist. Ribs moderately sprung, deep to elbows and oval. Slight forechest in front of point of shoulder. Chest of medium width. Tail is set high on topline, bends acutely forward and lies well curled over to either side. Medium width, strong and muscular, hocks well let down and turned neither in nor out, with long second thighs and moderately bent stifles. Feet-Same as in "Forequarters." Coat short and fine. Skin very pliant. Color-Chestnut red; pure black; tricolor (pure black and chestnut red); or brindle (black stripes on a background of chestnut red); all with white feet, chest and tail tip. White legs, blaze and collar optional. The amount of white should never predominate over primary color.Color and markings should be rich, clear and welldefined, with a distinct line of demarcation between the black and red of tricolors and the stripes of brindles. Click Here to Learn about breeder background checks on Basenji breeders if you are looking for Basenji puppies for sale. Click Here to learn how ResearchBreeder.com can help you find healthy Basenji puppies for sale. Click Here to order a Breeder or Kennel Background Check on Basenji Breeders that may have Basenji puppies for sale. 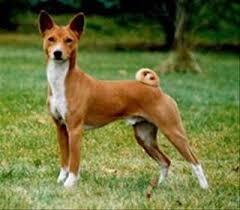 Click here to find the national breed club for Basenji puppies for sale. Click Here to purchase a list of approved ResearchBreeder.com Basenji Breeders who have Basenji puppies for sale.